Poor payment behaviour, a lack of information about the business or payment performance of customers, and economic and political risks have led to a reduction in the proportion of B2B sales in the Asia Pacific region being made on credit terms. However, the frequency of late payments seems to have declined as has the proportion of overdue B2B invoices. Still, the impact of late payments cannot be denied and it is taking businesses in the region more time to convert B2B invoices into cash. While 2018 brought small changes in the average proportion of uncollectable B2B receivables, some things remain the same – the main reason for writing off B2B receivables as uncollectable is the customer going bankrupt or out of business. With the exception of Australia and Singapore the use of trade credit in B2B transactions in the Asia Pacific countries surveyed is lower in 2018 than it was in 2017. As a result, the proportion of B2B credit sales in the region decreased from an average of 45.9% in 2017 to 43.6% in 2018. This marks the third consecutive of decline. This was mainly due to an almost five percentage point decrease in transactions on credit with foreign B2B customers. By country, respondents in Japan (with an average of 49.1% of B2B sales on credit terms) seem to be the most inclined to offer credit terms; respondents in China are the least inclined (on average, 39.8% of B2B sales on credit terms). Respondents in Asia Pacific are more likely to sell on credit terms to their domestic B2B customers than to their foreign B2B customers. Domestic credit terms seem to be granted mainly to facilitate business and local expansion, because credit sales are common practice and because respondents feel that this payment method is more convenient. There is also a shared belief that selling on credit domestically builds trust, supports trading relationships and helps attract new customers. These reasons point to important benefits for trading on credit, so why would respondents in the region refuse to grant credit terms? 35.8% of respondents said that this is due to the poor payment behaviour of their domestic B2B customers and 34.6% that it’s a decision based on the lack of information on their customers’ business or payment performance. We are granting trade credit to our domestic B2B customers mainly because we would like to maintain collaboration and this helps cash flow for both businesses. Businesses in Asia Pacific seem to grant trade credit to foreign B2B customers mainly because of the same reasons, common practice, convenience, to build trust and relationships and to attract new customers. There are, however, different explanations for refusing credit sales. More specifically, 45.5% of respondents in Asia Pacific said that they refuse to grant credit terms to their B2B customers abroad because there’s a high economic or political risk in the customers’ country, 38.8% due to high currency risk and 32.8% because they lack information on their customers’ business or payment performance. Trading on credit is a way to build trust. In Asia Pacific, the frequency of late payment has declined from an average of 89.2% in 2017 to 87.9% this year. This improvement occurred because respondents from all countries surveyed in the region – with the exception of Indonesia and India - reported payment delays less frequently than one year ago. Similarly to what has been observed in previous surveys, late payments seemed to occur almost as frequently with domestic and foreign B2B customers. The proportion of overdue B2B invoices in Asia Pacific declined from an average of 45.4% in 2017 to 44.5% this year. Marked decreases in the proportion of past due B2B invoices in Australia, Singapore and Taiwan contributed to the regional decrease. The average proportion of foreign past due B2B invoices was higher than that of domestic past due B2B invoices. In 2018, the average Days Sales Outstanding (DSO) figure recorded in Asia Pacific is 40 days, showing no changes from last year. Similarly to 2017, the majority of respondents in the region (50.3%) do not expect to see any changes in their company’s DSO figure and 22.2% expect a slight increase over the coming 12 months. In 2018, the average frequency of late payment was highest in Indonesia, Singapore and India (91.0%, 91.1% and 94.7% respectively). 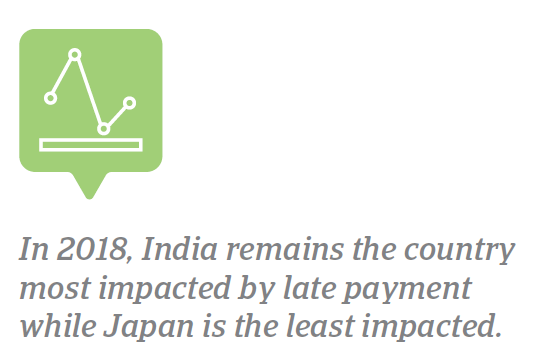 In contrast, and despite a minor increase observed in 2018, Japan remains the country with the lowest frequency of payment delays (on average, 70.2% of respondents reported payment delays). India continues to be the country with the highest proportion of domestic and foreign past due B2B invoices. 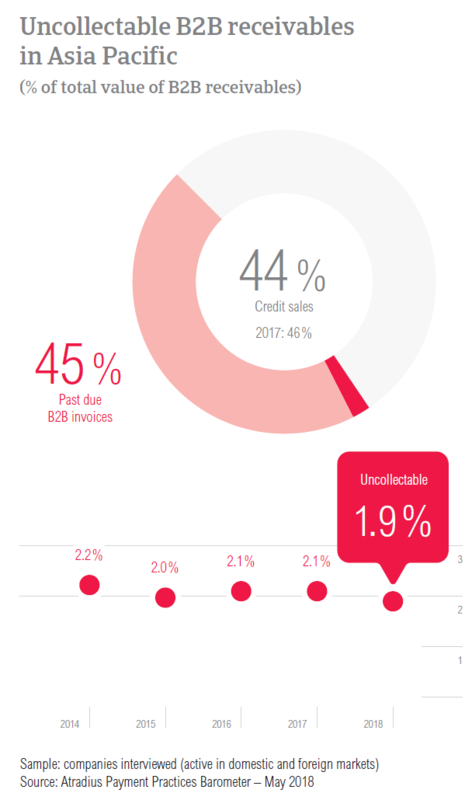 Additionally, the proportion of overdue B2B invoices here increased from an already high average of 53.4% in 2017 to 56.7% this year. This is also reflected in the country’s DSO figure, which increased by three days in 2018 and, at an average of 52 days, is the highest in the region. After India, one of the countries most impacted by late payments in 2018 is Indonesia (on average, 47.1%) – which has seen an increase of almost four percentage points in the proportion of past due B2B invoices. In 2017 Indonesia had one of the lowest averages in Asia Pacific. With 26.3%, Japan had the lowest average proportion of domestic and foreign past due B2B invoices in 2018. Domestic B2B customers of respondents in Asia Pacific are given, on average, 32 days to fulfil their payment obligations. This is three days longer than in 2017. Significant increases were recorded in India and Australia. Foreign B2B customers are given, on average, 31 days to settle their invoices (30 days in 2017). In 2018, payment terms to foreign B2B customers decreased significantly in China and increased significantly in Australia and Singapore. Despite these changes, respondents in Japan and Taiwan offered the most lenient payment terms to their domestic and foreign B2B customers (on average, 46 days and 45 days respectively). In contrast, respondents in Indonesia set the shortest payment terms in the region (on average, 23 days). When asked if their companies differentiate payment terms between domestic and foreign B2B customers, Australia, Singapore and Japan had the highest percentages for countries least likely to differentiate; in contrast, India and China are most likely to differentiate payment terms by customer type. The main reasons for differentiation mentioned in all countries surveyed are internal policies and local industry practices. Secondary reasons noted are that domestic payment terms are directed by law (mentioned in Australia and Japan) and due to the economic situation (mentioned in China, Hong Kong and Singapore). Payment delays in Asia Pacific have remained largely stable in 2018, with no changes reported in respect to domestic B2B customers (on average, 24 days) and an increase of one day in regards to foreign B2B customers (on average, 26 days). Australia and Singapore reported decreases in payment delays from both their domestic and foreign B2B customers. In contrast, and despite already reporting the longest delays in the region, respondents in India declared further increases. Respondents in Asia Pacific said that the main reason for payment delays by their domestic B2B customers is insufficient availability of funds. This was stated by 49.8% of respondents and is the same key payment delay factor as in 2017. The percentage of respondents reporting insufficient availability of funds at regional level increased following increases in all countries surveyed. The biggest increases have been reported in Indonesia and Australia – with Indonesia also being the country most impacted (as stated by 64.8% of respondents). Domestic B2B customers of respondents in Asia Pacific also delayed payments because the goods delivered or services provided did not correspond to what was agreed in the contract. This second most often cited reason was reported by 29.4% of respondents in Asia Pacific. The main reason for payment delays by foreign B2B customers is the complexity of the payment procedure, cited by 40.7% of respondents in Asia Pacific. This is the same as in 2017 (when it was cited by 34.9% of respondents). The percentage of respondents citing this as a reason for payment delays increased in all countries except Japan. Taiwan and Indonesia registered the most significant increases and were the most impacted with more than 50% of respondents citing it as a reason for payment delay. As was the case with domestic buyers, the second most frequently cited reason for payment delays is that the goods delivered or services provided did not correspond to what was agreed in the contract. This was reported by 31.9% of respondents in Asia Pacific. 28.2% of respondents in Asia Pacific said that payment delays did not have a significant impact on their businesses. However, 24.1% of respondents reported that they needed to take special measures to correct cash flow and 21.1% said that they needed to postpone payments to suppliers. For 15.9% of respondents, payment delays had a more significant impact as it led to revenue loss. Based on the changes in payment terms and payment delays, the average payment duration in Asia Pacific increased from 55 days in 2017 to 57 days in 2018. All countries surveyed in Asia Pacific with the exception of China and Singapore, have experienced an increase in payment duration. The most severe deterioration in payment behaviour was reported in India where the average payment duration increased 11 days in 2018, to 74 days. Of the Asia Pacific countries surveyed, this is the country in which it takes the longest to convert B2B invoices into cash. In contrast, respondents in Singapore seem to have the shortest invoice to cash turnaround (on average, 43 days). E-invoicing: a first step to faster payments? 60.2% of respondents in Asia Pacific said that they are already using e-invoicing when invoicing their domestic and foreign B2B customers. By country, respondents in India (with an average percentage of 79.3%) seem to make the most extensive use of e-invoicing. They are followed by their peers in Australia and China (with 72.6% and 62.8% respectively). In contrast, with a percentage of 31.9%, respondents in Japan are the most reluctant to invoice online. 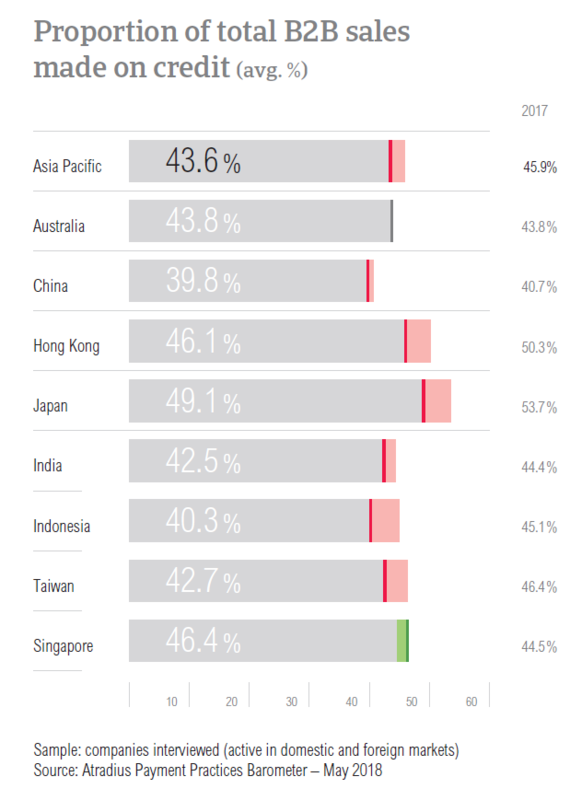 Despite having the second lowest percentage of respondents (53.3%) who invoiced digitally in 2017, Hong Kong is the country where the respondents are most willing to adopt e-invoicing this year. Despite the differences in implementation, the Asia Pacific countries surveyed seem to have broadly migrated towards paperless invoicing. But has the change to the online environment accelerated payments? 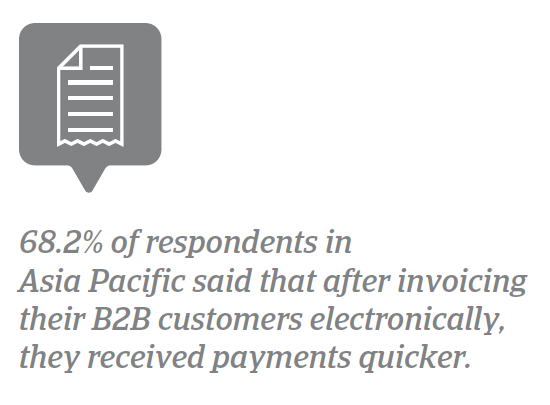 68.2% of respondents in Asia Pacific said that after invoicing their B2B customers electronically, they received payments quicker. This compares to a low 4.9% who said that e-invoicing led to a slowdown in payment and 26.9% of respondents who said that e-invoicing had no noteworthy effect. 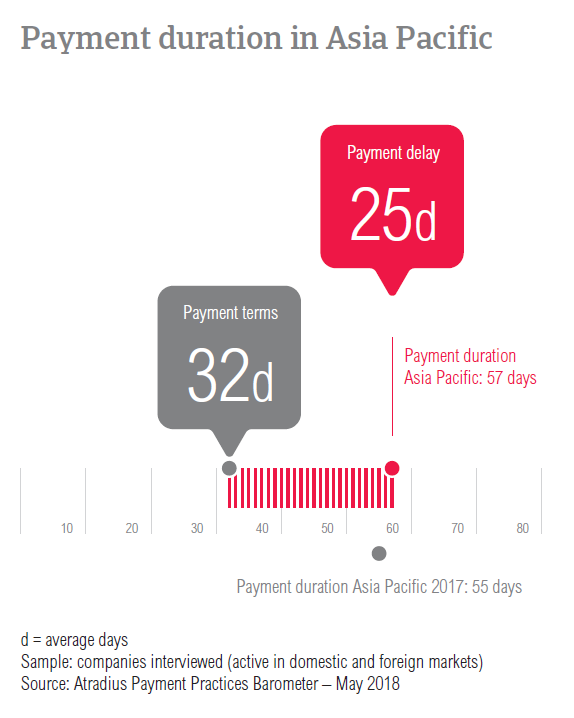 Despite the high percentage of respondents stating quicker payments after invoicing online, the average payment delays reported in Asia Pacific remained consistent to the previous year and – after the changes in the average payment terms given in the region – the average payment duration increased. In the context of growing insecurity due to global protectionist measures the fear of turnover losses is one that cannot be neglected when trading internationally. 25.5% of respondents in Asia Pacific expect as much as a 10% impact on their turnover due to uncertainty over and changes in trade agreements. A slightly lower percentage of 19.2% believe the impact on their businesses’ turnover will be more significant, between 10% and 20%. In contrast, 35.1% of respondents in Asia Pacific do not expect that their businesses’ turnover will be negatively affected by the uncertain prospects for international trade. The increased percentage is mainly due to the high percentages of respondents in Australia and Japan who said that they are most likely to not be impacted (53.6% and 50.9% respectively). While businesses trading internationally expect negative effects on their turnover, those focusing on only domestic B2B sales expect to see improvements. 29.0% of respondents in Indonesia and 19.0% of respondents in India expect the global protectionist measures to positively impact their businesses’ turnover in the coming 12 months. In 2018, all countries surveyed in Asia Pacific reported a decrease in the average proportion of uncollectable B2B receivables. This brought a decrease at regional level, from 2.1% in 2017 to 1.9% this year. With the exception of Japan, Australia and India, in 2018, uncollectable B2B receivables averaged around 2.0%. 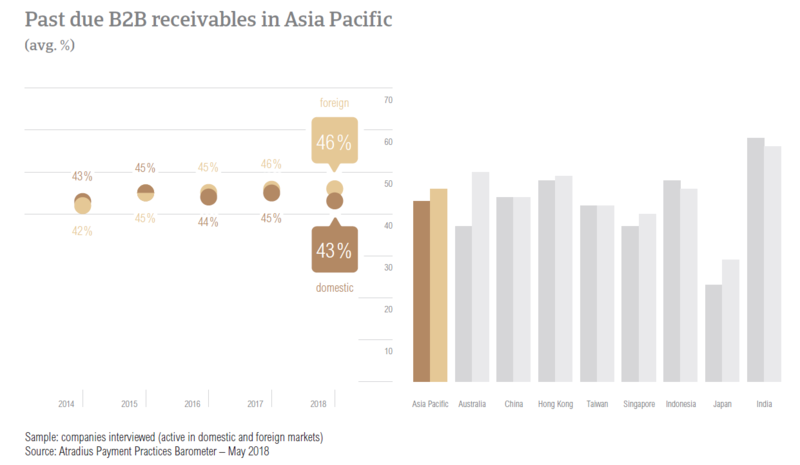 Similarly to 2017, and following another decrease in 2018, Japan and Australia had the lowest percentages of uncollectable B2B receivables in the region (on average, 1.2% and 1.3% respectively). India continued to be the country with the highest percentage of uncollectable B2B receivables in 2018. However, there was a small improvement, from an average of 2.6% in 2017 to 2.4% this year. Uncollectable receivables in Asia Pacific originated most often from the consumer durables, construction, electronics and business services sectors. B2B receivables were reported to be uncollectable mainly because the customer went bankrupt or out of business. This view seems to be shared by 50.1% of respondents in Asia Pacific, a higher percentage than the previous year. Secondary reasons were the age of the debt (cited by 37.3% of respondents) and the failure of collection attempts (cited by 36.3% of respondents). In 2018, respondents in Asia Pacific gave their customers 32 days, on average, to fulfil their payment obligations. Looking at the average payment terms by sector, with the exception of the paper sector, respondents in Asia Pacific gave their B2B customers payment terms around the regional average or slightly above. B2B customers of respondents in the paper sector were given, on average 40 days to fulfil their payment obligations. In contrast, the shortest payment terms were given to B2B customers in the food sector – who were asked to pay within 24 days, on average. 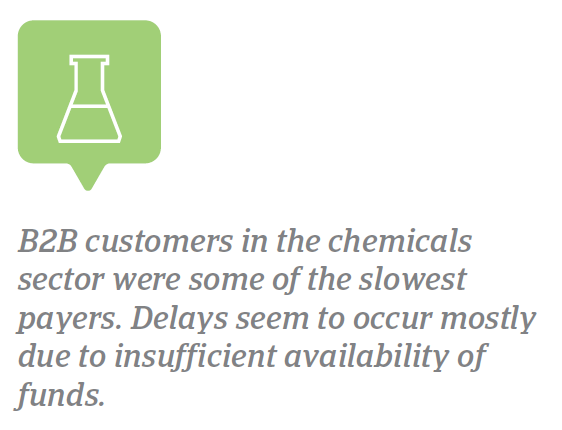 B2B customers of respondents in the chemicals and construction sectors seem to have generated some of the longest payment delays. Domestic and foreign B2B customers in these sectors paid, on average, 31 and 27 days late respectively. Similarly to what was stated at regional level, the main reasons for payment delays were insufficient availability of funds and disputes over the quality of goods delivered and services provided. Following the payment delays experienced this year, the majority of respondents in Asia Pacific reported that they do not expect any changes in the payment behaviour of their customers in the chemicals and construction sectors. This seems to be a shared belief in regards to B2B customers in all sectors. However, of those who do expect to see a change over the coming 12 months, 37.0% expect an improvement and 16.0% foresee a deterioration.